Ottawa’s origins base around it being centrally located in Canada. At the time, it was midway between Montreal and Quebec City to the east and Kingston and Toronto to the west, roughly the centre of the young country at the time. Its location at the Ontario/Quebec border also balanced it politically between the two regions. 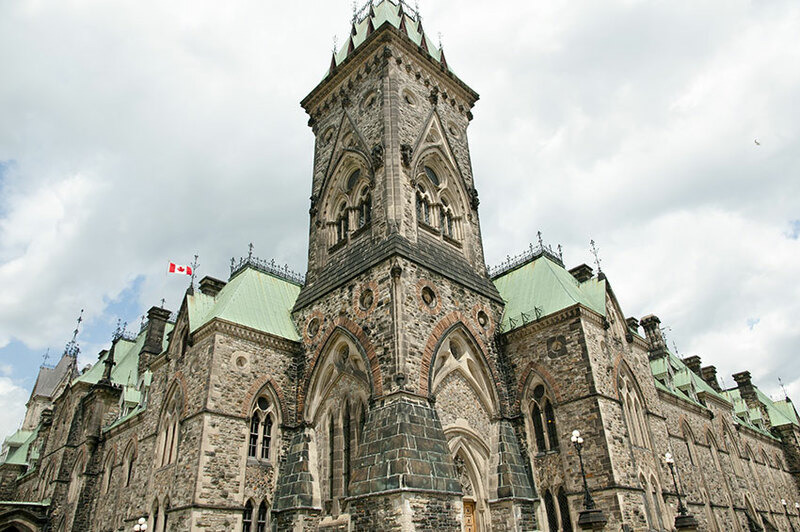 The bluff that’s now named Parliament Hill was chosen for its defensibility. The town site, miles from the U.S. border, had the advantage of heavy forests around its other sides. The relatively remote location guarded against U.S. invasion and angry mobs of citizens, a problem in previous capital city locations. The contemporary city comprises a metropolitan region that spans the provincial border. The Ottawa-Gatineau metropolitan region is Canada’s fourth largest in population, with over 1.2 million residents. An affluent and educated city, at almost 6,000 square kilometers, Ottawa covers a large area and creating long commutes. The table below shows Ottawa car insurance estimates for a sample driver. We surveyed the car insurance prices in the city of Ottawa for the purpose of illustrating the range in quotes based on driving record, location, and other criteria. To get a customized quote, enter your postal code above. As with any major metropolitan centre, Ottawa suffers from big city congestion as workers heading for jobs in the downtown area flock in from the suburbs. Traffic volume contributes to an increased number of accidents and the resulting insurance claims nudge auto insurance premiums up for everyone in the surrounding areas. In spite of this, Ottawa is not near the top of the spectrum in terms of provincial car insurance averages. While insurance premiums usually depend on personal factors contributed by the driver taking out the policy, other conditions affect pricing, including where a motorist lives. The contrast between Ontario and Quebec may be at its widest when it comes to car insurance. Ontario’s rates are the highest in Canada while Quebec’s are the lowest. Private insurers provide complete auto insurance coverage in Ontario while Quebec uses a hybrid system, where the government provides personal injury protection and private insurers issue comprehensive, collision and top up coverage. This means that two drivers with similar insurance circumstances, but living on opposite sides of the Ottawa River could see over $600 difference in their car insurance bills. Quebec’s provincial average is about $700 annually, though Gatineau motorists pay an average just under $800. It may not be enough to trigger moves into Quebec, but it’s a substantial difference. Highway 417 is the major through route in Ottawa. The 417 runs southwest to northeast, from Stittsville to Exit 115, where it turns to the south and east, continuing to the Ontario-Quebec border at Voyageur Provincial Park. Because it’s the major highway access and the main route in from Ottawa’s western suburbs, the 417 is frequently subject to rush hour congestion. Highway 19 follows the course of the Rideau River, from the Ottawa airport north to the 417. Highway 416 connects the Ottawa area to the 401, intersecting with the 417 east of Kanata. Public transit in Ottawa consists of a mix of regular buses, express buses and light rail transport. Additional LRT projects are in the works. Bike travel has more popular support in Ottawa than in most large Canadian cities. Over 220 km of multi-use paths crisscross the city. The Ministry of Transportation of Ontario maintains a web page specifically for Ottawa traffic reports. Winter travel conditions for Eastern Ontario can also be found on the MTO’s site. The City of Ottawa maintains online information for road closures and construction work. Local media report traffic information and provide updates online. CTV Ottawa includes maps and MTO traffic camera views. CBC Radio in Ottawa reports real time traffic on its Twitter feed. The OttawaStart.com website consolidates traffic information from a variety of sources. Short term weather reports for Ottawa and area are found here. 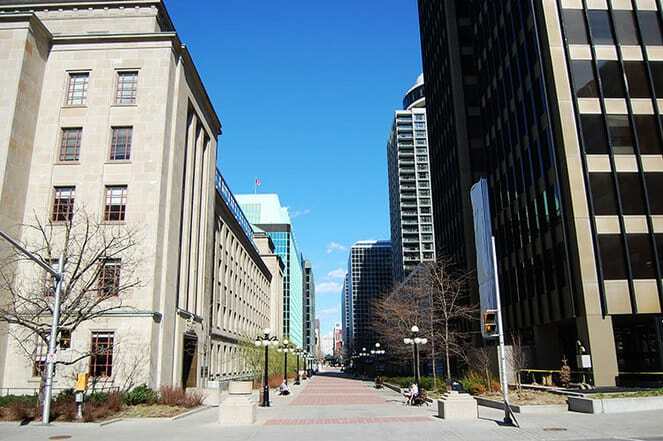 In 1967, as part of Canada’s Centennial celebrations, Sparks Street in Ottawa was permanently closed to vehicle traffic and converted to a pedestrian plaza. Closing the street to vehicles started in the summers in 1960, the first Canadian city to do so. Construction on the Confederation Line, an LRT project through the centre of the city including a 2.5 km underground portion, is already underway. When completed in 2018, the line will stretch 12.5 km. Phase 2 plans to extend the line an additional 30 km by 2023. The geology of the land upon which Ottawa rests is occasionally subject to sink holes. One such hole opened in early 2016 near Confederation Line construction, swallowing up an unoccupied van belonging to a local locksmith business. The van and its contents were buried in the street collapse. Recovery was impractical and engineers determined the weight of the sandy soil burying the van was sufficient to crush the vehicle so that no further void would remain. Ottawa’s transit system already includes BRT, or Bus Rapid Transit. Featuring park and ride stations and grade-separated bus lanes, the BRT helps remove congestion from central Ottawa using high-frequency bus service to support offices and government organizations downtown. The Trillium Line already operates in Ottawa, a pilot project of the O-Train system. Using existing rail lines from the old Canadian Pacific Railway, extending about 8 km. Ridership exceeded expectations, but though the project was a success, expansion of the Trillium Line is not currently in the works. The Ontario auto insurance market is competitive, with every insurer using their own method to calculate premiums. Looking at averages may not give an accurate reflection of the prices individual motorists pay since there are many other factors besides home location contributing to car insurance policy costs. No matter where you are in Ontario, Ratelab’s car insurance calculator provides your best protection against unnecessary high insurance costs. Enter your personal car insurance information into the calculator and you’re provided with no-cost, no-obligation Ottawa car insurance quotes from the most affordable providers in your area.